These are the Best Gift Ideas for New Moms from loungewear to luxury, every new mom will love these thoughtful gift ideas that go beyond baby! The holidays are upon us and I’m sure many of you have already started your holiday shopping (Yay you!) but for those of you who are still working on that list and have a new mom in your life this gift guide is for you! As a new mom, I can tell you first hand, my life now revolves around my daughter. Which I’m totally okay with, but, sometimes it’s nice to feel like people still think about YOU and not necessarily about the baby (but really they’re always thinking about the baby). I’ve collected some of my favorite gift ideas for new moms that go beyond baby, as in, no baby products will be recommended on this list. This list will focus on gift ideas that will treat the new mom herself and not her new status. Wine & Spirits – The woman spent almost 10 months (possibly longer) without consuming alcohol and she might appreciate a nice bottle to have on hand after those really long days. Put it together in a small basket with these cute socks and adult sippy cup! Loungewear – Everyone wants to be comfortable, but many new moms practically live in their pajamas and yoga pants (these ones are my favorite and one size fits all! ), so a nice set of loungewear will be much appreciated. The Saturday/Sunday line is so comfortable and worth every penny! And this Mama Bear shirt is pretty cute too! Mattress – Okay, hear me out, this might seem like a weird gift, but this mattress is the BEST (and the price is even better) and it will make those few minutes of sleep feel amazing! This is a great gift to get if you know the mom really well and know a mattress upgrade is something she could really use. Spa Day – Every woman loves to be pampered so a gift card to a spa for a mani/pedi or a massage is a great idea. But you could also make a spa gift basket with a homemade sugar scrub, rejuvenating eye gels, and Pumpkin Mud Mask that smells like dessert! Candy – For a small gift or stocking stuffer, go beyond her favorite candy (but get that too) and splurge on some of the fun candies from Sugarfina, these Champagne Gummy Bears are my favorite! She’ll be thankful for the little pick-me-up during those late night feedings. Portable Photo Printer – It’s impossible not to take a million photos a day as a new mom and while we live in a digital world, sometimes it’s nice to have printed keepsakes. I love this Portable Printer because it lets me print right from my phone! Drip Coffeemaker – Mama needs her coffee and she may not have time to run to Starbucks! I love my Chemex Coffeemaker because it’s easy to use, super chic looking, and makes a fine pitcher of coffee. Be a doll and get her a Yeti Insulated Mug to make sure her coffee is still hot when she finally gets to drink it 3 hours later. Or these SUPER cute enamel mugs for mom OR dad! Audible Gift Card – If you’re not already using Audible yourself, check out my Beginner’s Guide, and then grab a gift card for the new mom in your life. She’s likely too busy to sit down and watch an episode of tv, but an audiobook in the background can go with her whether it’s in the car to an appointment, the kitchen to warm up a bottle, or the shower on the rare chance she gets one! Mother’s Jewelry – This is always a big want for a lot of mothers, I personally don’t really wear jewelry, but I can appreciate the simplicity of a dainty piece of jewelry (which are super trendy right now) I thought this birthstone necklace and this mama bear bangle were super sweet pieces! 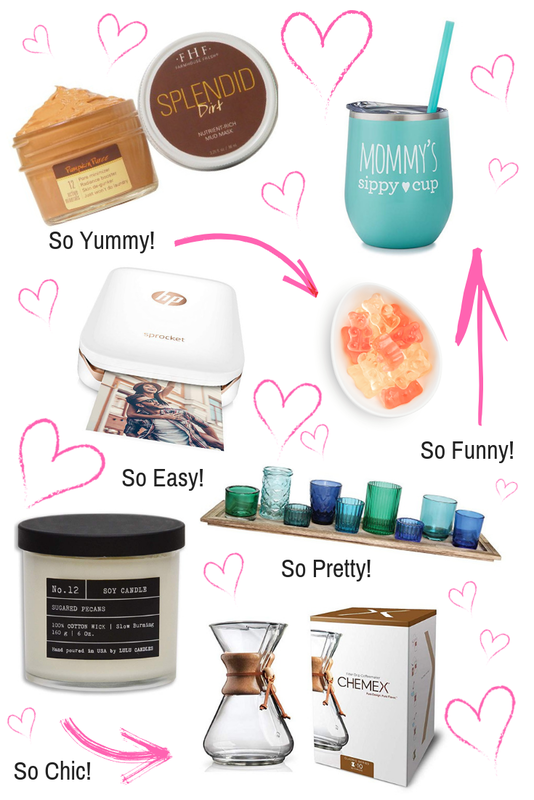 Pin this New Moms Gift Guide for Later!